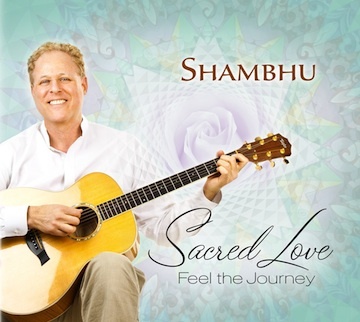 “It’s the project I had on the shelf and it emerged thanks to a decline in the economy, which gave me personal time to discover and create this music,” says Shambhu, who’s debut CD, Sacred Love was released today. Described as a “soul-elevating and magical journey, like riding a perfect wave,” Sacred Love features an all-star list of Grammy award-winning collaborators brought together by Shambhu, including Windham Hill Records founder Will Ackerman (co-producer) and recording and mixing engineer Corin Nelsen. One reviewer praises Sacred Love as “possibly the best project Will Ackerman has ever been involved in.” The other artists that Shambhu and Ackerman assembled are no less impressive. They include: Tony Levin on bass (tours with Peter Gabriel), George Brooks on saxophone (recorded with John McLaughlin and Zakir Hussain), Ravichandra Kulur (tours with Ravi Shankar and Anoushka Shankar), Jeff Haynes on percussion (toured with Pat Metheny), Celso Alberti on drums (toured with Steve Winwood), Charlie Bisharat on violin (toured with Shadowfax), Premik Tubbs on flute and windsynth (toured with Santana and Mahavishnu Orchestra) and Eugene Friesen on cello (toured with Paul Winter Consort). With the economy faltering, Shambhu decided to embark on a journey that many would have considered unthinkable. Putting his public relations business on the side for a year, he assembled the creative team and all-star artists behind Sacred Love, thereby finally realizing his life’s passion of creating a CD of his own music, and dedicated this effort to his 87-year-old mother who did not expect to live through the making of the CD due to health issues. Thankfully she is still alive enjoying this music, the realization of her dream, too. Watch a 25-part YouTube series, “The Making of Sacred Love” at youtube.com/shambhumusic. Buy Sacred Love at SacredLoveCD.com.